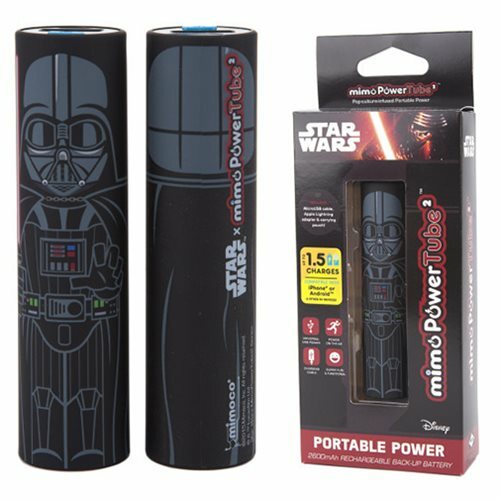 Recharge your important devices with the Star Wars Darth Vader Mimopowertube 2 Portable Charger. This pop-culture-infused portable charger has a power button, a four-level LED light power indicator, a 1A output, and a smooth glossy finish. No more guesswork needed to figure out how much charge you have left! With a 2600mAh rechargeable battery the MimoPowerTube2 is compatible with iPhone, Android, tablets, and other 5V devices. Each MimoPowerTube2 comes complete with a MicroUSB cable, Apple Lightning adapter, and carrying pouch to keep all your pieces in one place! Measures nearly 4-inches long. Ages 13 and up.